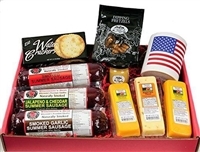 The ULTIMATE USA Gift Box features Smoked Summer Sausages, 100% Wisconsin Cheeses, Water Crackers, Dipping Pretzels, a Sweet & Tangy Mustard, and features the USA Flag Mug. This is perfect for anyone seeking a tasty gourmet solution for a high protein snack as well as a ready to serve snack for any occasion. 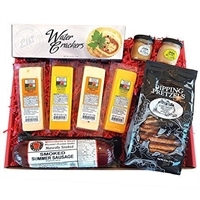 A hearty gift box full of a delicious variety of naturally smoked original and garlic summer sausage, cheddar and pepper jack cheese, crackers, gourmet pretzels and mustard. 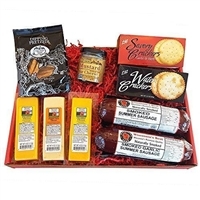 A hand-packaged gift anyone would love, or an appetizer for game-day parties! 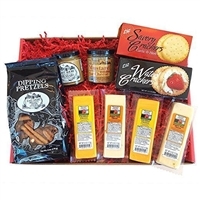 A truly Gourmet variety of delectable snacks including Wisconsin Cheddar and Pepper Jack, 2 Varieties of Crackers, Dipping Pretzels and 2 Varieties of Mustard. 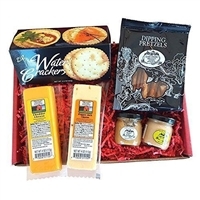 Perfect Gift for the snacker in your life. Bring to your next game day party! 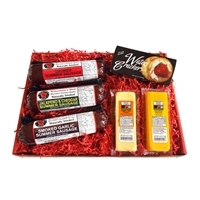 Wisconsin's Best and Wisconsin Cheese Company together provide only the highest quality cheese and summer sausage. 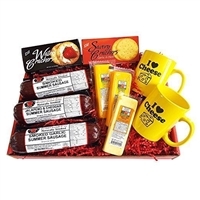 Our gourmet gift boxes also include other Wisconsin Cheese Gift Mugs, Travel Cup, and Crackers. Be a Cheese Head! This WISCONSIN'S BEST & WISCONSIN CHEESE CO. 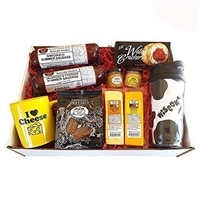 Gift Basket features Smoked Summer Sausages, Wisconsin Cheeses, Crackers & 2 Mugs.